The might of lions meets the roar of a dragon in the Lion Pride Brass Dragon Dagger. 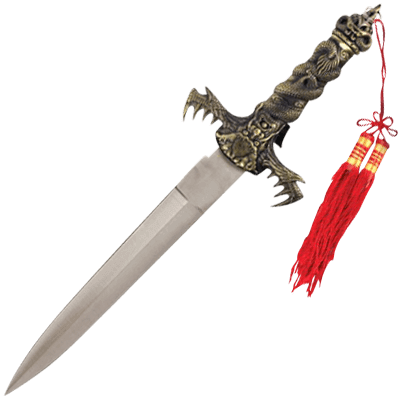 This decorative dagger draws inspiration from Eastern myth with a serpent-like dragon curling around its hilt as a tassel hangs from the pommel. Made of stainless steel, the spear point blade of this ornate knife features a central ridge. Brass coloring decorates the entirety of the hilt, from the spiky, scale textured guard to the dragon tail and cloud swirls wrapping the grip, and even down to the curling serpents that adorn the pommel. The face of the dragon, with wide eyes, furrowed brow, and an open jaw appears at the center of the guard. Also detailed with brass tones throughout, the dagger sheath displays a lion face emblem at its throat and an image of a lion upon a rock halfway down its length, surrounded by filigree leaves and shapes. Two chains are suspended from these dragon emblems, adding detail to the dagger sheath while providing easy means for carrying or display. 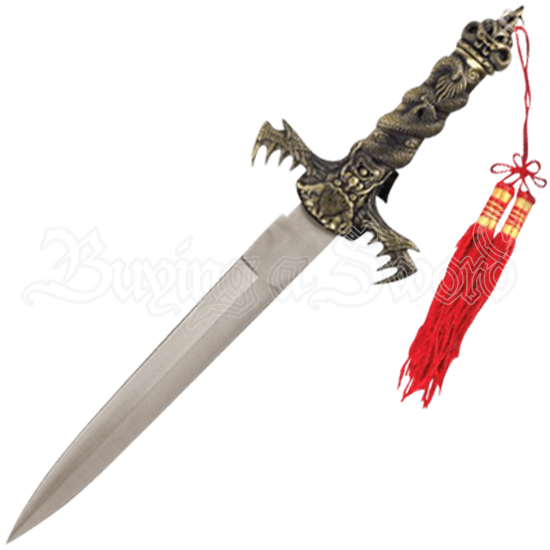 A fantastically ornate take on historical weaponry, this decorative dagger makes a unique gift, collectible, or home decor piece.